A solar powered generator is one that can be charged with solar power. This has become the most efficient alternative energy source that is renewable. But with any renewable, alternative sources, it is always best to understand your needs as well as weigh the pros and cons of the various options available. Modern technology has brought in many innovations in this field too. However, a thorough knowledge of the system will go a long way. Initialize with the starter kits or the entry level models to gain better understanding of the solar powered generators. Given below is a review of the best three products in solar generators. A solar power generator is the most environment friendly system as it does not produce any fumes or any noise. It keeps the environment clean and green. These solar generators become the ideal choice, when you experience sudden power outages, or in emergencies or as backup power source. There are many portable solar power generators that are best for your household needs. Choose from the various options according to your needs. It is cost-effective, reliable, and eco-friendly. Decreases the utility bills and the dependence on the grid. Small solar generators are ideal for camping and free source of power backup. Generally very compact and portable. Before buying a solar generator, it is a good idea to know more about the features and components of the solar generators. Determining the number of watts that you will need, will certainly make it easier for you to choose the best product that gives you optimum results. Here is a brief description of the various features and technical specifications of the best three solar generators. 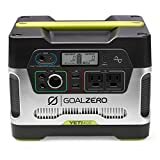 A compact unit, the Goal Zero 23000 Yeti 400 Solar Generator lets you off the grid comfortably. It is a great source of power for any unexpected outages, camps, and even cabins. You can run your televisions, lights, mobile phones, and small appliances on this solar generator. Charging the solar generator is pretty easy and can be achieved in three ways. The best way is always charging from the sun. Otherwise, this solar generator can be charged through a car charger or through a standard wall unit. Plugging it to solar panels increases the charge capacity! The Goal Zero 23000 Yeti 400 Solar Generator comes with an advanced LCD display that helps you understand the power consumption. It has a got a futuristic design and can be used indoors as it does not create any fumes. This solar generator is also chainable. This solar generator is a modest battery unit that serves as a great entrant to the solar power world. It has an easy to read display with a standard back lit screen. It is a plug and play unit which is very silent in operation and the most useful in emergency situations. This solar generator does not produce fumes. It is a good source of portable power to charge your phones, laptops and lights running. There are three different ways in which this solar generator can be charged. It can be charged through the sun by connecting to a solar panel or by plugging into a regular wall outlet. With a 12V adapter, the Goal Zero 22004 Yeti 150 Solar Generator can also be charged by plugging into the car. The Yeti 150 solar generator uses a 12V sealed lead-acid battery, AGM battery. For the battery to last longer, they should not be drained completely and should be always fully charged. This solar generator comes with a pop-up handle that is very convenient to use and comes in a stackable shape which ensures that taking the battery on long rides is safe and easy. 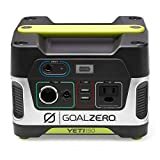 The Goal Zero Yeti 1250 is a large solar generator. This is quite heavy and weighs at around 103 pounds. But the rolling cart that is included makes it very portable and useful. This solar generator is perfect for indoors as it does not produce any fumes nor does it make any noise. It is an ideal system to have during emergencies and power outages. It can power most of the appliances like freezers, refrigerators, phones etc. A strong conclusion that we can come across is the benefit that solar power gives us. There is nothing to beat solar power. The portable solar power generators are definitely worth the investment as they are clean and quiet and are of great use in emergencies and even power outages. Getting off the grid is now possible if you have the right amount of power back up using solar generators.